Part of our focus at Papé Machinery is to assist you in finding the best machine for you and your needs. This process often begins before you even walk into one of our stores and we understand how difficult it can be to navigate between so many features and models. That's why we’ve compiled a list of questions to consider when talking to one of our Papé Machinery members. Asking these questions will help our team narrow down exactly what you need and that means we can get you onto your new piece of equipment as fast as possible! 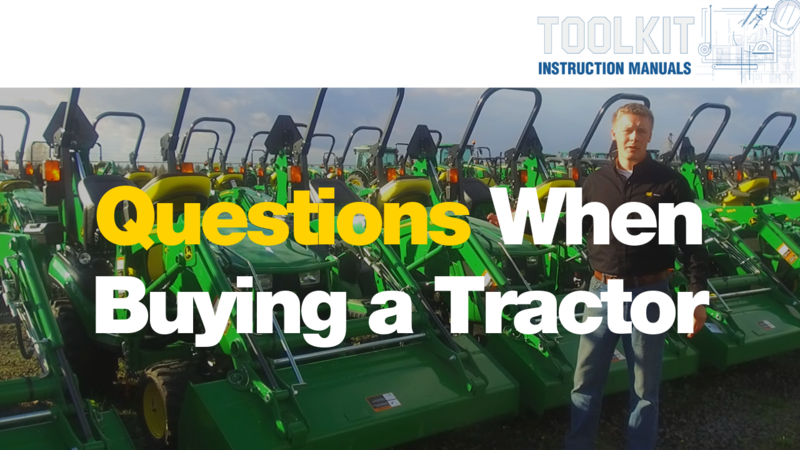 Below, we’ve outlined 4 question categories to use in-store or to simply think about before making your next tractor purchase. Next, run through how you’ve been using your current piece of equipment or hope to use your first piece of equipment. Ask yourself how often you plan to utilize your tractor and who will have access to it. This can help you find similar models to your current machine and bypass models that might not fit into your current usage. What are you using to get the job done currently? Who will be using this equipment? How often on a weekly basis are you planning on using your tractor? Are there any jobs you're looking to simplify? You now know the environment and what you currently use, but you still need to narrow it down to a few models. Having specific preferences regarding functionality and features can make the decision much easier and help guide you to the tractor that checks every box on your list. How big (weight/size) are the projects you're planning? Are there additional tasks you'd like your new tractor to do? Are there specific attachments you currently use or hope to use? Do you see yourself using multiple implements at once? The final factor to keep in mind is the different attachments and accessories that go along with a new machine. This includes things such as seat type, detachable cabs, and add-ons. Keeping these last few things in mind will make sure that you don’t miss out on any additions that you’re looking for in a new tractor. Are you looking for comfort/attachable features? Do you like to work on/tinker with your equipment? Do you see yourself changing out features such as tire type? There you have it, you’re well on your way to your perfect John Deere tractor! For more tips and tricks, be sure to subscribe to the Papé Machinery Agriculture & Turf YouTube channel, where you can catch our weekly series The Toolkit - Product Insights From the Pros. Have a question you'd like us to answer or a specific topic you'd like to see covered? Send in your suggestions to pcmarketing@pape.com and it may get featured in a future video or blog post! Welcome to The Toolkit, where you can find all the “tools” necessary to work on, maintain, and upgrade your property and equipment with the assistance of Papé Machinery and John Deere.